Here is another of the 28 varieties of hibiscus we have in our garden. This variety is called Sundance. It is a cultivar of Hibiscus rosa-sinensis. If you look closely, you may be able to spot a small green insect (species unknown!) in the throat of the blossom. I didn't see the bug when I was taking the photo. I only noticed it after I looked at the enlarged photo on my computer monitor. This is so pretty! I sometimes forget these come in colors other than red (smile). Hi 2Sweet - Yes, although the red hibiscus is the "classic," they do come in many other colors. 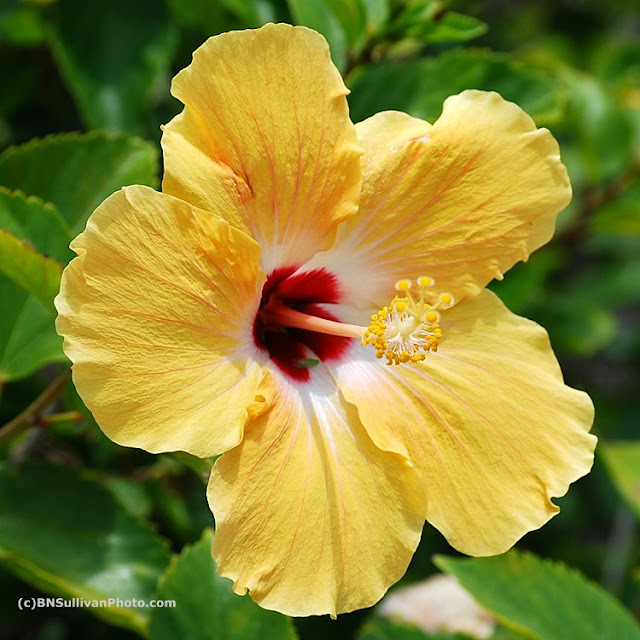 Very beautiful hibiscus! Well taken! Excellent colours and sharpness! A great lense you have on hand. Thank you very much, Jing Hui.